Wash and rinse lentils. Place in saucepan and cover with cold water - do not add salt. Bring to boil and boil rapidly for 10 minutes with lid on. Reduce heat and simmer for 10 minutes with lid on. Add more boiling water if needed during cooking, test for tenderness at the end and cook a bit longer if needed. Whisk garlic, mustard, oil, salt and pepper in a small bowl then slowly whisk in vinegar. Set aside. 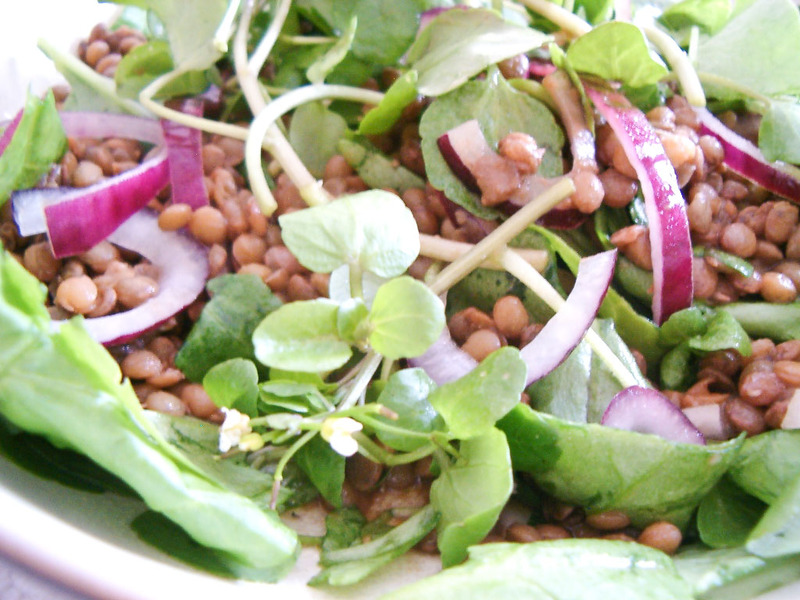 Toss together the spinach, watercress and red onion. Drain lentils well then toss in the dressing. Spoon lentil mixture over top the salad and serve immediately with fresh french bread. Nutrient info per serving: Calories 369, fat 18g, carbs 35g, protein 18g, calcium 144mg, iron 8mg. Had this for dinner last night - yum! Thanks for the comment and I'm so glad you liked it!